Dated around the time she was married to baseball great Joe DiMaggio while living in San Francisco, it was decided that the recipe was authentic for, among other reasons, its lack of garlic, which DiMaggio reportedly despised! 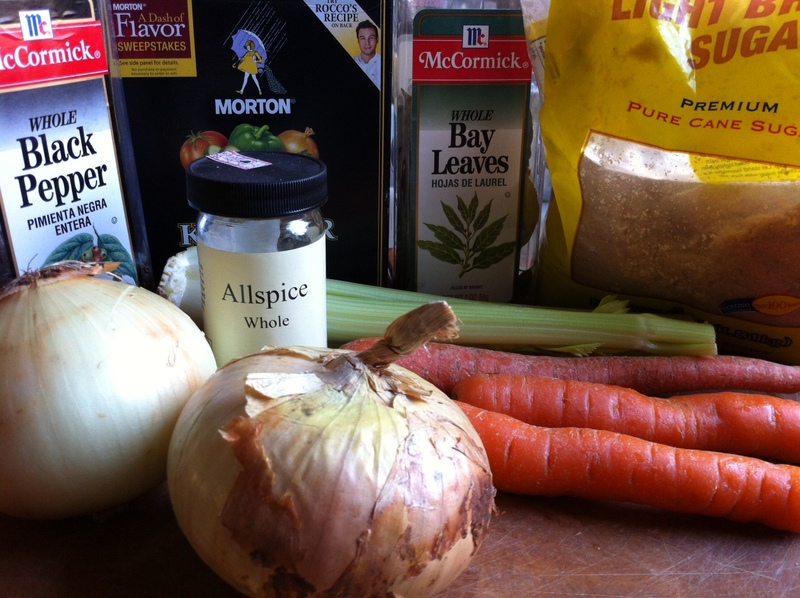 I tried the recipe years ago and tweaked it, adding garlic, of course. This makes a family sized platter of stuffing. Using a food processor to chop makes things much easier. Break the sourdough into pieces and soak them in a large bowl of cold water for 15 minutes. Wring the excess water out over a colander and shred the bread into pieces. Boil the chicken livers for 8 minutes in salted water, then chop them into small pieces, placing them in a food processor and pulsing until you get smaller pieces. In a skillet over medium-high heat, brown the beef in the olive oil, stirring occasionally. Break up the meat into small pieces. In a large mixing bowl, combine the sourdough, livers, ground beef, celery, onions, parsley, eggs, prunes or raisins, Parmigiano Reggiano and nuts, tossing gently to combine. In a separate bowl, combine the rosemary, oregano, thyme, bay leaves, salt and pepper and scatter over the stuffing mixture. Mix again. Taste and adjust for salt. Refrigerate, covered with foil, until ready to bake. To bake: Pre-heat your oven to 350 degrees. Cook 1 hour with foil on top. Remove the foil and cook for 1 hour more at 300. Keep an eye on it. Ovens vary, and you want it out of the oven before it gets too dry. If it does get dry, sprinkle a little chicken stock or water on it, cover with foil, and heat for 10 minutes. Once you’ve washed, peeled and seeded the butternut squash, cut it into ½” chunks. Sprinkle a little olive oil and salt on them and toss them to coat. Then spread the squash cubes in a single layer on a baking sheet. Bake them for about 30 minutes or until they’re golden on the edges. Remove the squash from the oven and pour the cranberries into the hot tray. Mix gently. Pour the squash/cranberry mix into a smaller, deeper baking pan. Increase the oven to 425. 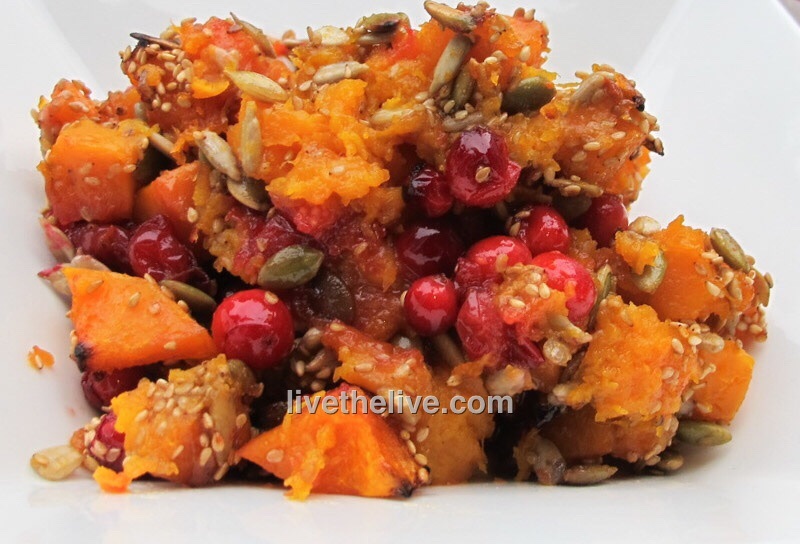 In a separate bowl, combine the sunflower seeds, pumpkin seeds and sesame seeds. 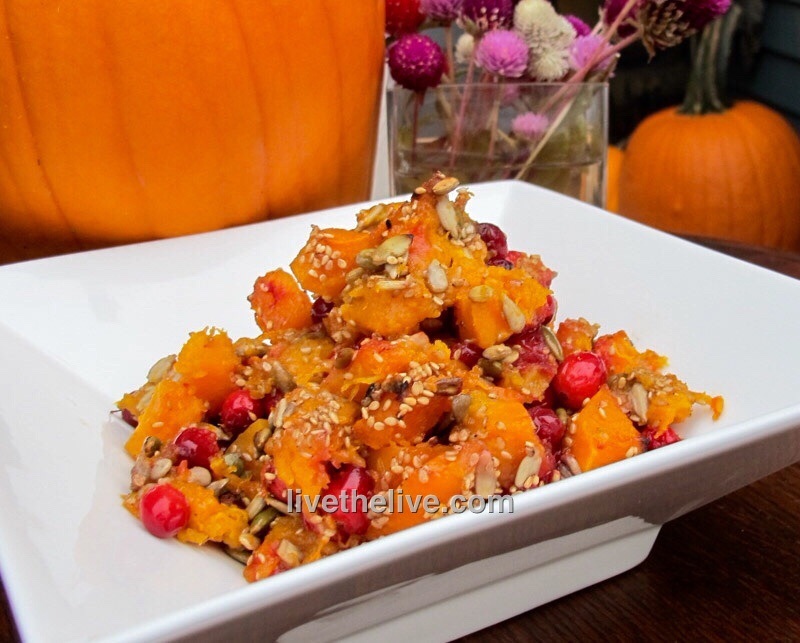 Sprinkle the seeds evenly over the squash/cranberry mixture. Drizzle the maple syrup over everything and place the baking pan in the oven. Cook for another 20 minutes, until the seeds have roasted. My Mom loves that nasty, gooey cranberry log that oozes out of the can. It would hit the bowl with a splurt and would wiggle for about an hour. I’m more than happy to avoid that and make this delicious side dish, which has become mandatory at our Thanksgiving table every year. Once you’ve washed, peeled and seeded the butternut squash, cut it into ½” chunks. Sprinkle a little olive oil and salt on them and toss them to coat. Then spread the squash cubes in a single layer on a baking sheet. Bake for about 30 minutes or until golden on the edges. I’ve never been a huge fan of deep-fried turkey. Many years ago, when I lived in the Alabama, my friends went through the trouble of buying and setting up all the special frying equipment, and the turkey did taste pretty good. But it wasn’t exceptional, and it didn’t justify the expense or the clean-up afterwards. For me, nothing beats the taste of a grill-roasted turkey. I get great results by cooking my turkey in my Weber grill. The standard Weber allows you to cook up to a 15 lb. bird–big enough for my purposes–and it comes out crispy, smokey and delicious. If you’re afraid to try this for the first time at Thanksgiving, wait a few months and buy a turkey on sale when you have the craving and try it out. Although I’ve stopped using charcoal briquettes a long time ago, and now strictly use natural hardwood charcoal, this recipe works best with standard Kingsford briquettes. 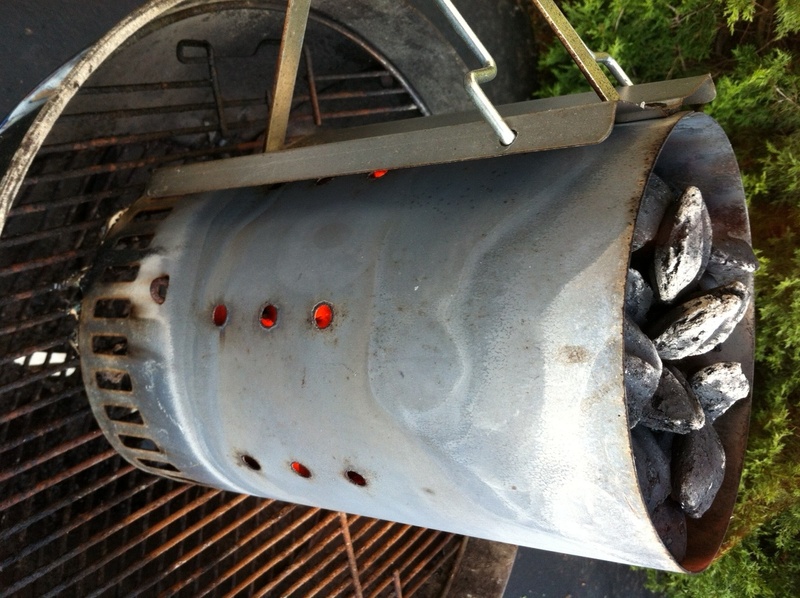 The idea is for the coals to cook slowly and evenly. Never use lighter fluid…always start the fire with a few pieces of crumbled newspaper under a charcoal chimney. And never, ever use a product like Match Lite, unless you like your food to taste like gasoline. If you want stuffing, cook it separately. Remove the giblets from the turkey. 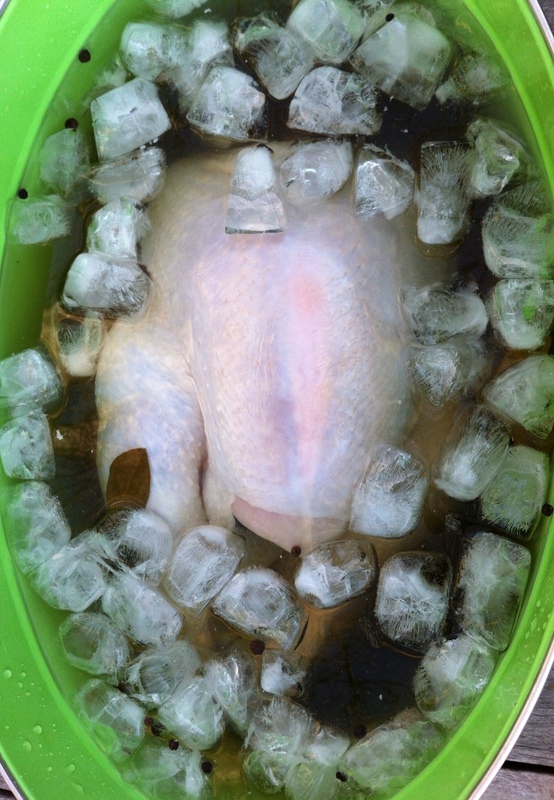 Place the bird in the aluminum pan. In a small bowl, mix the granulated garlic, onion powder, salt and pepper. Add any other seasonings you like. Coarsely chop the onions and celery. Place them in a another bowl. Mix them with the melted butter and 1/3 of the salt/pepper/garlic powder mixture. 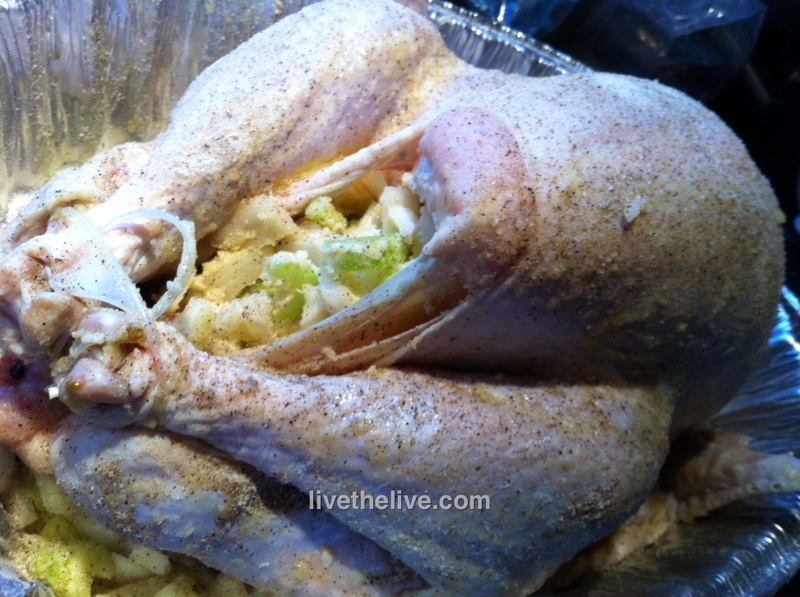 Place a small handful of this “stuffing” mixture in the neck cavity of the turkey. Place the rest in the body cavity (where the stuffing would usually go.) You can fasten the bird with turkey skewers if you like. 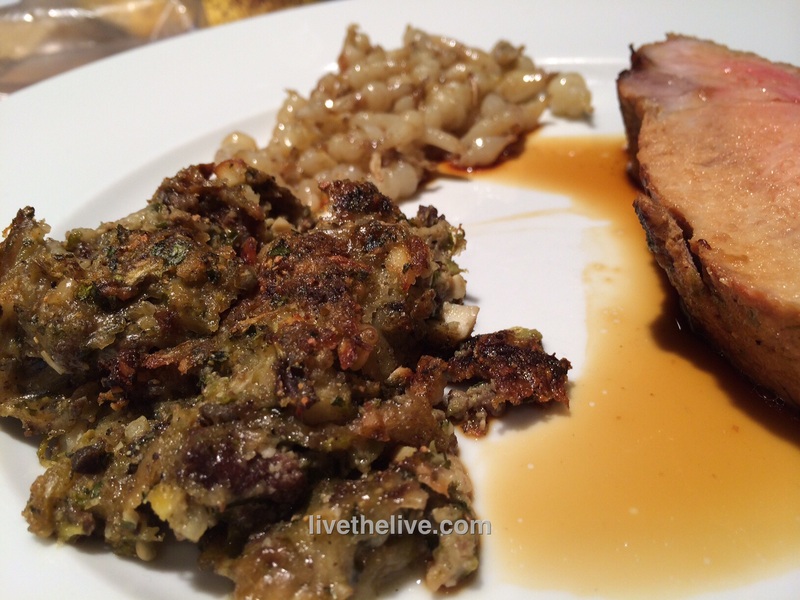 This “stuffing” is strictly to flavor the turkey…you don’t eat it! 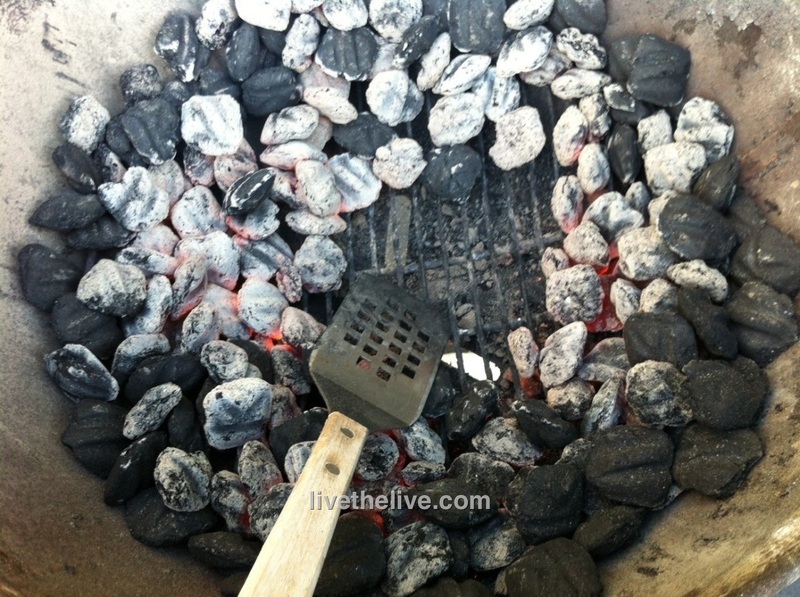 When the coals in the grill have ashed over, spread them to the outside edges of the Weber equally. Put the cooking grill rack in place. 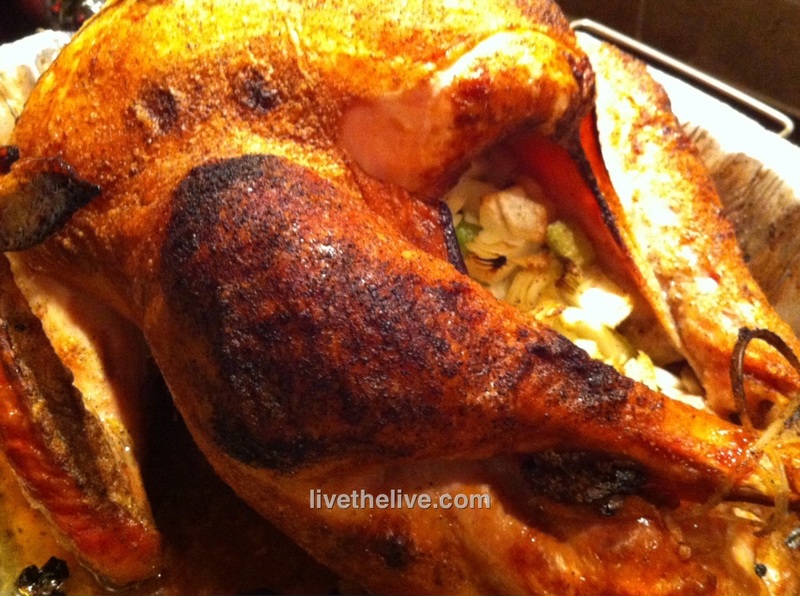 Place the aluminum pan with the turkey in the center of the grill, keeping it away from the direct heat of the coals. If you’re using a meat thermometer (recommended), insert the probe into the thickest part of the breast, being careful not to hit the bone. Place the lid on the grill. (You may need to bend your pan a bit.) 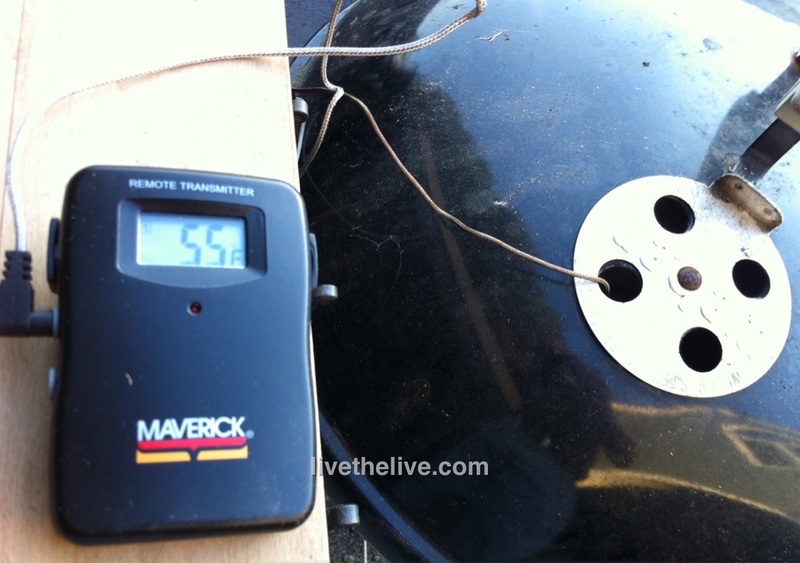 Open the vents on the bottom of the Weber as well as the lid. It’s important to get air circulating! My meat thermometer calls me from as far as 100 feet away when the turkey reaches the optimum temperature that I pre-set. Time for a drink! Remove the turkey and let it rest at least 20 minutes before carving. Beautifully grilled, cooked to 180 degrees in less than 2 hours! I’ve never been a huge fan of deep-fried turkey. Many years ago, when I lived in the South, my friends went through the trouble of buying and setting up all the special frying equipment, and the turkey did taste pretty good. But it wasn’t exceptional, and it didn’t justify the expense or the clean-up afterwards. For me, nothing beats the delicious smokiness of a grill-roasted turkey. I get great results by cooking my turkey in my Weber grill. The standard Weber allows you to cook up to a 15 lb. bird–big enough for my purposes–and it comes out crispy, smokey and delicious. If you’re afraid to try this for the first time at Thanksgiving, wait a few months and buy a turkey when you have the craving and try it out. 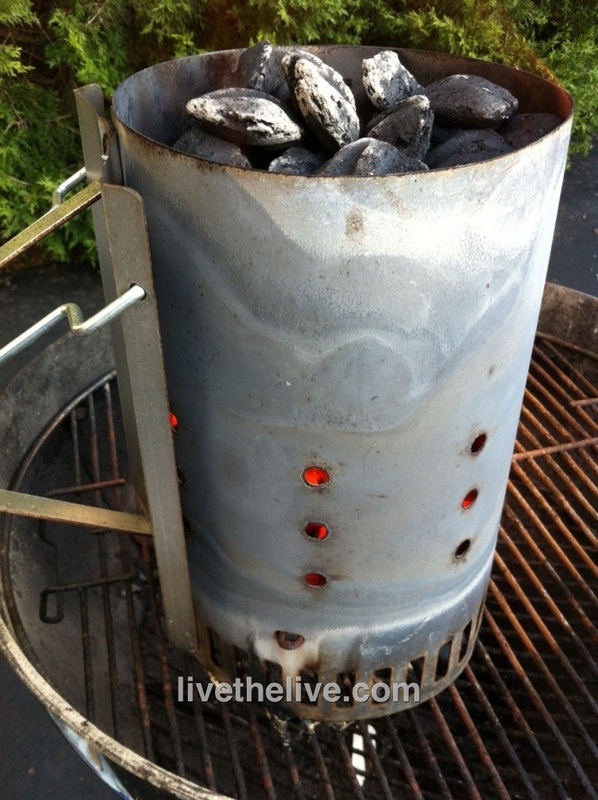 Although I’ve stopped using charcoal briquettes a long time ago, and now strictly use natural hardwood charcoal, this recipe works best with standard Kingsford briquettes. 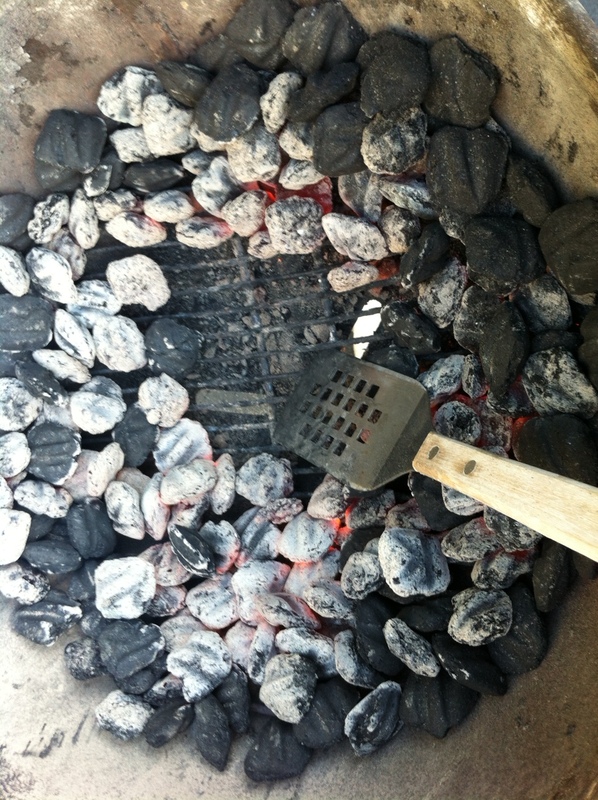 The idea is for the coals to cook slowly and evenly. Never use lighter fluid…always start the fire with a few pieces of crumbled newspaper under a charcoal chimney. If you want stuffing, make it separately and cook it separately. In a small bowl, mix the granulated garlic, onion powder, salt and pepper Add any other seasonings you like.